Derek Sheils celebrates his victory in the feature race at the Cookstown 100 in 2017. Derek Sheils will have to do it the hard way if he’s to maintain his winning record at the Cookstown 100. The Cookstown B.E. Racing rider’s Suzuki GSX-R1000 suffered an engine failure on the first lap of qualifying at the Orritor course on Friday. Michael Dunlop is back at the Cookstown 100 for the first time since 2015. Sheils made it back to the pits in time to set his qualifying time on the ex-William Dunlop 600 Yamaha, finishing 12th on the combined time sheets. The Dublin rider has won the last four Superbike races at Cookstown and is unbeaten on the big Suzuki at the County Tyrone meeting since 2016, but he will need something extra special if he’s to chalk up a fifth successive victory in the big-bike class for John Burrows’ Dungannon-based team. Not only will Sheils be starting from the B Group, with corrected time coming into play, but the 35-year-old faces his toughest opposition in a number of years as Michael Dunlop lines up on the Tyco BMW Superbike. Dunlop hasn’t raced at Cookstown since 2015 but the Ballymoney man remains the outright lap record holder and is the standout name in a quality field. 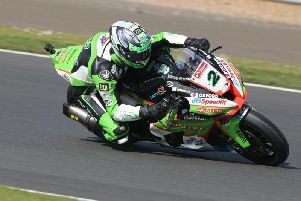 The 29-year-old qualified third fastest on the S1000RR, less than three tenths behind pole man Derek McGee. Dunlop may be using Cookstown primarily as an opportunity to squeeze in some much-needed track time ahead of the North West 200 next month, but he is likely to take all the beating.